It's a miracle! Our gardenia plant that has been half-dead for 2 years finally bloomed for the first time. The blooms are scraggly but smell amazing. I immediately recognized the scent as it smells just like the gardenia candles in our store. Not all flower fragrances are an exact match to the actual flower (like peony, orchid and sunflower) but this was spot on prompting my search for the perfect gardenia candle. Gardenia flowers smell exactly as they look - thick, heavy, velvety, milky, creamy and white. If you're not a huge fan of florals, you might want to start with something lighter in quality and work your way up to gardenia. If you like heady florals that really fill a room, be sure to try a gardenia candle. The fragrance is lovely and unforgettable. This gardenia scented candle is rich and warm with a buttery note and a hint of creamy coconut. It's heady but not heavy or overdone. I definitely recommend this fragrance if you are looking for something close to the real deal. I enjoyed the Voluspa Gardenia 12oz jar candle that is milky white and translucent so you can see the candle burn adding to the ambiance. This candle is also available in an adorable votive, 2-wick tin candle that is perfect for gifting and a large, opaque, ceramic vessel. The Voluspa Gardenia Colonia room spray and diffuser work well to complement the candle. Fragrance intensity 4/5. Burn quality 4.5/5. This gardenia fragrance is clean and playful with an almost juicy quality. The candle wax glows as it burns creating a memorizing effect. I highly recommend this candle if you are looking for something true and memorable. The Red Flower petal-topped large candle lasts 50-60 hours. The petite candle last 15 hours and is perfect for a powder room with its minuscule size. Fragrance intensity 4/5. Burn quality 3/5 (it was a very old tester). Wow! Very pleasantly surprised with this one. It has a strong layer of fresh cut greens that lifts the scent creating a very lovely floral bouquet. It's not has heavy or heady as most gardenia fragrances - which is good and bad. Good for me as I'm not a huge fan of heavy florals, which is why I'm enjoying this one so much. Bad if your looking for a true gardenia fragrance. I wouldn't say this is dead-on gardenia. Of all the gardenia candles on this list, this one strays the farthest from the actual flower, but I really enjoy this variation. I highly recommend this scent if you enjoy floral bouquets. Fragrance intensity 4/5. Burn quality 4/5. If you're looking for a gardenia with a little more depth and earthy nuances give this one a try. The warm amber and musk come through lightly adding nice character. I love the look of this elegant vessel with the candle is burning. The fragrance was not overwhelming in an average sized room. Fragrance intensity 4/5. Burn quality 4/5. This is a very smooth and mellow gardenia fragrance. It's elegant and refined yet incredibly simple. If you're looking for comfort over outstanding, this fragrance will love you for the long run. I love the hand-blown vessel and long burn time. Fragrance intensity 4/5. Burn quality 4/5. Hands down, this is definitely the most beautiful vessel in the bunch. Absolutely stunning pale pink beaded glass with a iridescent finish. 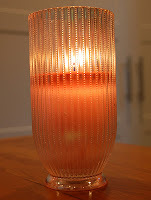 It will make a gorgeous flower vase when the candle is done. The fragrance is lovely as well. It doesn't smell as much like the gardenia blooming in my front yard, but I certainly am not growing Tahitian Gardenia. This is a sensual blend and I can pick up the notes of freesia complemented by creamy milk and and coconut. Voluspa Tiares is available in the large Alta vessel, short Corta vessel and Petite vessel. All of the fragrances in the Voluspa L. Florem Collection have been made into adorable little perfumes and rich hand cream. Fragrance intensity 4/5. Burn quality 5/5. I love this natural blend that is incredibly close to the actually flower. There's a fruitiness to this fragrance that makes it incredibly enjoyable and not burdensome. Fragrance intensity 4/5. Burn quality 4/5. What is your favorite gardenia candle?